At their new home in the Villa Air-Bel, Aube and her family are used to things being hidden. Among the secrets kept at the ch teau are a radio (for listening to the news), a cow (for a little extra food), and--most secret of all--Aube herself. Even with the threat of Nazi capture looming over their heads, life at the villa has been colorful for the refugees awaiting their escape to safety. Joined by writers, musicians, artists, and great thinkers like Marc Chagall and Max Ernst, Aube spends each day singing, playing games, and creating art. Together, this lively congregation are able to fight back fear and hatred with bravery and laughter--not just for young Aube, but for themselves as well. 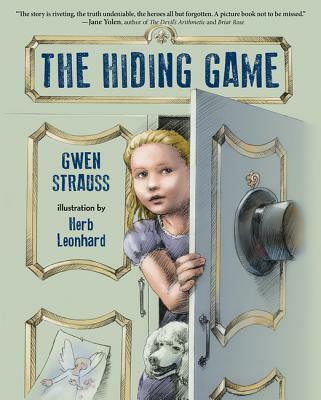 Breathtakingly illustrated and written by the great-great-niece of a member of the American Rescue Committee who sheltered Aube, this book offers an intimate look at one of the many courageous efforts to conceal Jewish refugees from the Nazis. It is a story of passion, creativity, and resilience, offering children and adults alike a harrowing glimpse at one of history's darkest periods.